From whom do we derive and receive our rights? You know the ones. The life, liberty and pursuit of happiness rights listed so famously in the Declaration of Independence. Do they come from the Almighty or from us? 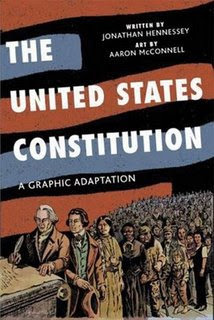 This is just one example of how THE UNITED STATED CONSTITUTION: A GRAPHIC ADAPTATION is more than an outline of the seven Articles and the Bill of Rights. This graphic novel details the struggles and the back-story that led to the writing of the most famous and important of government documents. More than a listing and explanation of rights, THE US CONSTITUTION gives the reader a fair and accurate view of the creation of the document and the successes and lamentations of the various contributors. The whole affair was far from courteous, civil or congenial. It was full of acrimony and anger, heated debates and disputes, grandstanding and name calling, much like our contemporary political landscape. We are not so different. If we are to celebrate our great democracy – and I say “democracy” understanding that what we really have is a republic, which is another issue discussed in the text – then we must understand our founding documents. What better way to study something considered stuffy and boring by so many than to breathe comic life into it? The 160 pages are dense yet concise, detailed but clear. Complete with Federalists versus Anti-Federalists, philosophical differences of the people, an explanation of the Electoral College and its original purpose, the issues of the divine right of Kings, the Preamble, the Articles, The Bill of Rights, and the Amendments, THE US CONSTITUTION is jam packed with democratic nutrition, enough to chew on for months. Aaron McConnell’s illustrations are brilliant in their effectiveness of depicting complex themes and ideas in discernable ways. The style is reminiscent of the political cartoons of yore and his use of iconography is clever and informative. Click here to view a trailer of the book. This is a hard book when it comes to recommending an appropriate age. In Missouri, fourth grade students learn a lot about government and citizenship, and this title would be an extraordinary companion to that study. However, I would not typically just hand the book over to most 9- to 10-year-olds, as the reading level is generally much too high. To use certain pages during learning would be more than appropriate with most upper elementary students. Considering differentiated instruction – a lesson plan that includes diverse learners such as students with disabilities, English language learners and gifted students – THE US CONSTITUTION may need to be a required text for the gifted students in any upper elementary classroom. It would be an exciting piece for those students who require further study to keep them engaged; there is much they would learn. For the most part, older students – middle school and high school – would benefit much more from the intricacies and depth of THE US CONSTITUTION and I would suspect they would have fun learning about it. If you talk of government and democracy, or discuss our rights as citizens, if you are interesting in the foundation of our country, then THE UNITED STATES CONSTITUTION: A GRAPHIC ADAPTATION is a required text for you or your classroom. From upper elementary to college, this book has a rightful place in the classroom, and the home bookshelf for that matter.